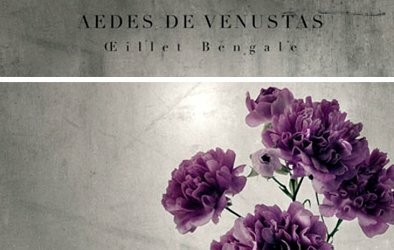 Oeillet Bengale is the upcoming fragrance from West Village niche perfume boutique Aedes de Venustas. It's their third, following 2013's Iris Nazarena and 2012's Aedes de Venustas Signature. If you've tried the first two, you probably already expected incense, and the name Bengale Oeillet, if you speak French (or even just perfume-French), probably led to you to expect carnation. You'd be right on both counts. The press materials point out that the Bengale Oeillet is actually a rose (a variety of China rose, to be more specific), but that's not relevant to our concerns. The Aedes Bengale Oeillet is a carnation-incense fragrance, something I never particularly thought to wish for — I'm still waiting, patiently, for my perfect jasmine + incense — but that turns out to be welcome. For Oeillet Bengale, Aedes turned to perfumer Rodrigo Flores-Roux. They call the result a "fierce, fiery, feral flower", but I'd call it a purring kitten, in fact, it will make a great comfort scent, if you're among those of us who find spicy incense fragrances comforting.1 It starts off, though, with a bracing whoosh of bergamot, spices and citrus, already dusted with powder (for a minute or two, it reminded me of my beloved, nearly forgotten Crown Eau de Russe). The spices intensify as it dries down and the carnation joins in. It's more pepper-y than clove-y (clove-y carnations are a thing of the past)2, but clove is listed in the notes, along with black and white pepper, cinnamon, cardamom, clove, saffron, and turmeric (other notes: vanilla, tolu, benzoin and labdanum). A bright, clear incense is an equal player with the carnation — this is emphatically not a carnation soliflore, and it's well worth trying even if you're not typically a fan of carnation. The resinous notes in the base are softened by the powder, which sweetens slightly in the far dry down. Oeillet Bengale is full-bodied, but it's not quite as heavy (or dark) as Iris Nazarena. Still, to my nose it's possibly not a summer fragrance — I haven't been able to test the proposition, but I'm guessing it will work best from October through June, leaving the hottest summer months aside. The lasting power is quite good, as is the sillage. Verdict: Love. It's my favorite from Aedes so far. This is as good a place as any to insert my disclaimer — Aedes is a long time advertiser at Now Smell This, and I'll just reprint the same footnote I used when I reviewed Iris Nazarena.3 When I reviewed that scent, I said that if it came in 15 or 30 ml, it would be on my buy list; since then, Aedes has introduced (nicely split-able) 10 ml travel spray trios, so this one is going on my buy list. Aedes de Venustas Oeillet Bengale will be available in 100 ml Eau de Parfum, $245, or in a purse spray with three 10 ml refills, $195. The purse spray refills are $110. 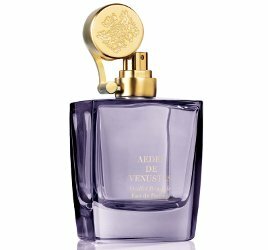 For buying information, see the listing for Aedes de Venustas under Perfume Houses. 1. And I'd entirely forgotten that Rodrigo Flores-Roux was responsible for Donna Karan Black Cashmere. 2. Due to modern restrictions on eugenol. And by the way, if anyone has tried the new version of Malmaison from Floris, Malmaison Encore, do comment. 3. Just to clarify, we don't take direct advertising from perfume brands for precisely this reason — I'd rather not be in the position of reviewing products made by our advertisers. Since some retailers have started introducing their own branded perfumes, and since I also don't want to ignore great fragrances, which are after all few and far between, here we are. But I will readily admit that if I didn't think Iris Nazarena Oeillet Bengale was wonderful, I probably wouldn't review it at all, so in that sense, I think you can say that this isn't a totally objective review, if such a thing indeed exists. Objective or not, your review makes me want to try Oeillet Bengale. I can’t believe I forgot he did that one. And Donna Karan Gold, which I also loved. I can’t wait to try this. Interesting to know the same perfumer did Black Cashmere! Yes. And I like that Aedes has used 3 different perfumers but each scent is entirely in their style. Incredibly tempting review. I’ve been really impressed with Aedes’ strategy with regard to their house brand- testing the waters with the L’Artisan for Aedes scent a few years back, then releasing a small number of quality fragrances one at a time. Very, very smart. And clearly, they are good at creative direction, which not all fragrance lovers are. I still have to be convinced that this one is better than my Iris Nazarena, but will definitely try it. And the refill bottles are well done (differently from various decants, they don’t ever leak, and are appealing in their austerity). Way to go! Wait — I did not say it was better, just that I liked it better! Carnation is my favorite note (well, it’s a tie between carnation and vanilla). I must try this. Ah, then hope you will love it. Actually, I think it would be really nice over a vanilla lotion or cream. I love carnation but prefer clovey over peppery. I am stuck in the past but it just smells better, imo. Is there a chance I may still like this? Too much pepper with carnation is no good…and not a carnation soliflore?:(. Cloves are awesome…hate restrictions:(. And I just sniffed Beautiful by Estee..the current one they have out now…what are they doing to the classics?:(. Smells no good now:(. Well, since it isn’t in fact a soliflore, the lack of clove might be less of an issue? Friends have been chattering about this recently, so your review is SO timely, Robin. I did NOT like Iris Nazarena despite my love of iris, but the appearance of the 3x10ml refill set may make this a blind must-buy just to satiate my curiosity. I’m also curious about Floris Malmaison Encore and mentioned it yesterday when I was wearing LeGrand Oeillet Louis XV (which is nice, but very subtle, and probably not something I’d want more than my current decant of). One carnation scent I wouldn’t mind having more of is Cartier L’Heure Convoitée, which is probably nothing special, and merely “quite pretty,” but it works for me and I find it really enjoyable. Pity those Cartiers aren’t available in smaller bottles as well. Joe, will be interesting to see if the travel refills are available at the outset…I’ve no idea. Occurs to me now to wonder what’s up with Lorenzo Villoresi Garofano, which I actually liked better than Malmaison anyway. Can’t see how it can’t be significantly changed, though. And glad to hear that about the Cartier since I have not tried it! Crying because a.) there’s no carnation “oomph” w/o eugenol, and b.) Aedes’ once-fabulous $15 sample program is now $27.50 (and I was too dumb to order as many samples as possible under the old program!). The oomph factor would matter more to me if this were a floral. Since it’s not, there’s plenty of oomph coming from elsewhere! But do see what you think. And did not know that, I should update my shopping page. I am overdue to stop in at Aedes! I must try this. I am hankerimg over the Penhaligon Tralala. I’ll try it at Saks when it arrives and then give Aedes my perfume money and perhaps obtain a few samples* of this. Since I don’t use scented lotion, I may try layering this with Vanille 44 to temper the spiciness. Sampled in March during visit to Aedes. I did not find it overly peppered at all, much to my delight. I’m wondering how this compares with SL Vitriol d’oeillet. I liked that one enough to snap up a partial bottle that I happened to notice lying around on ebay. I like it because it’s dry, unisexy and natural; almost not floral. Sort of fills the same kind of occasion niche as Iris Silver Mist or vetiver. I guess it’s peppery. They’re not much alike to me…VdO, was sort of a aldehydic peppery rose. This is more powdery floral, and closer to carnation, although with the incense it’s pretty unisex also. I didn’t like the SL one at all..I hope it’s nothing like that one. Glad to hear it’s not overly peppered. It’s not much like it, to my nose. Beautiful review and even more beautiful bottle. This fragrance sounds divine. Is there any kind US folk who could help and get a sample for me? It will be in Europe too…they’ve got a number of retailers in Europe. I know, but unfortunately not in Poland (or maybe, Iris Nazarena appeared in Poland with slight delay). Ordering just one sample from First in Fragrance is not worth the cost of shipping. Jasmine-incense?? I’m waiting right there with you! Do we already have an iris-incense? I can’t think of one. This sounds beautiful, but then I’m a fan of incense fragrances even more so with some floral added, i.e. I love Mecca Balsam with the touch of tuberose. We don’t really have an iris incense, do we? But I want my jasmine incense, with plenty of green notes. Nobody ever seems to make one. I think Bond Silver Factory is iris/incense. It’s also the only Bond fragrance I can apply directly on my skin. All the others I’ve tried are headache including sillage monsters that require my to dab them on a card, let the card dry, then very gently pass over my wrist. Andy Tower did an iris incense named Orris, a limited edition of 200 bottles, due to the cost of iris butter. Gaia reviewed it on The Non-Blonde in 2007 and listed it among her favorite LEs this year. I have a small sample. If you imagine SL Iris Silver Mist with a touch of L’Air du Desert Morrocain, you have the idea. There’s also DSH Iridum, which I have not smelled. My bottle just arrived! I ordered it unsniffed because that’s how I roll. I also own Aedes L’Artisan and Iris Nazarena and adore them so at least I was familiar with the house style. Carnation was an early perfume note obsession for me but I arrived just in time to miss Prada No. 7 Oeillet. I do have Bellodgia, CdG Red Carnation, Black Cashmere, Terracotta Voile d’Ete, Tabac Blond, Old Spice, every hippie oil at BPAL that mentions carnation, etc. This fragrance bears almost no resemblance to any of those. It does not have the familiar clovey carnation note and it doesn’t smell like a fresh floral. I would say it resembles a softer L’Air du Desert Marocain or Lonestar Memories minus the smoky rubber gasoline note (which I love). It’s definitely unisex and very much in the house style. I like it a lot. I slacked off my sampling and swapping activity when I got sick but I still have sample vials if anybody wants to try it. Oh, so glad you like it … that would be an expensive mistake! And do the 3 bottles look lovely together? I have the original Aedes in the deep purple/crimson L’Artisan bottle. Iris Nazarena and Oeillet Bengale are beautiful together but I can only tell them apart in direct light because they’re very similar in color. I did a double take when I opened the box yesterday. Yesterday I already had several fragrances on my skin and clothes so it wasn’t until after a shower that I could really smell it on its own. The rose in the opening is lovely and I can detect a whisper of real carnations but the initial spicy note is more cinnamon than clove. I think my first impression that it resembled a lighter, airier version AT L’air du Desert Marocain is still true. It stays very close to the skin but I could still smell it when I woke up. Thank you! I just realized I called it No. 7 rather than No. 2.